The American Association for the Advancement of Science (AAAS) announced that Bandana Chatterjee, Ph.D., a prostate cancer researcher at The University of Texas Health Science Center at San Antonio, has been named a 2014 fellow. With 25 years of experience at UTHSCSA, the investigator was chosen by her peers in recognition of her contributions to the scientific field. Chatterjee is a professor in the Department of Molecular Medicine, and serves as the deputy director of the Cancer Therapy & Research Center (CTRC) at UT Health Science Center San Antonio. Tim Huang, Ph.D., who nominated her for this year’s award, explained that “Chatterjee has been a very dedicated scientist for the past 25 years in this area of research, prostate cancer,” adding that she is not only a mentor but also a role model for future generations of female scientists. Born in India, Chatterjee holds a bachelor’s and master’s degrees in chemistry from the University of Calcutta. After moving to the United States, she completed her Ph.D. in biochemistry in 1977 at the University of Nebraska, Lincoln. She then served as a postdoctoral fellow in molecular endocrinology at Oakland University in Rochester, Michigan. [adrotate group=”15″]She has been focused on developing alternative treatments for prostate cancer, and have been supported by different organizations as well as federal grants. 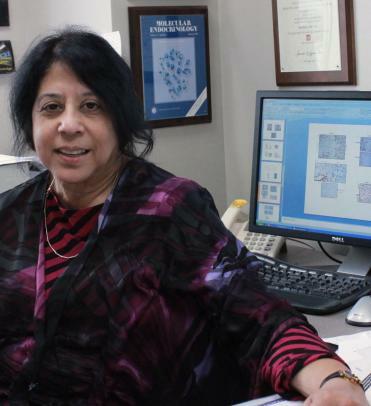 Chatterjee was also nominated as U.S. Department of Veterans Affairs (VA) Research Career Scientist for the first time in 1999, and three more times after that. Her career has been closely connected to both the South Texas Veterans Health Care System and the Health Science Center.